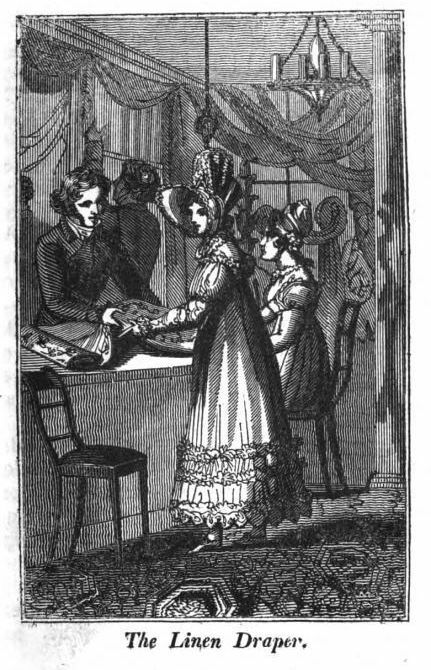 But Chapman’s woes were not over yet and the month after the Williams case, Martha Jones tried to nick a shawl, but Edward Griffith was on to her(7) and in 1842, it was yet another shopman, Charles Hewitt, who stopped Peter Collins from wandering off with a pair of gloves. (8) And in May 1844, it was Chapman himself who apprehended Mary Ann Watson for stealing 11 yards of mouseline-de-laine. (9) Whether it was the frequent thefts or the less than perfect business acumen of Chapman himself, the drapery in Tottenham Court Road only lasted until 1845 when Chapman assigned his estate and effects onto John Bradury and Henry Sturt, both warehousemen, for the benefit of his creditors. (10) What happened next to Chapman is unclear, so we will continue with the businesses who occupied the corner shop after him. One William Hardwick, laceman, is next found on the premises, but he went bankrupt in 1849, so that business did not last very long either. (11) The 1851 Post Office Directory lists Henry Tautz & Co., silk mercers, on the premises; all still in the drapery line of business, but the 1856 Post Office Directory lists William Davies, hairdresser for 1 Great Russell Street, so a complete change. The 1871 census shows Joseph H. Starie, bookseller, on the premises, and in 1882, an advertisement appears in the Daily News for Benson’s, a company selling rubber hoses at number 263. They had another shop at 4 Tottenham Court Road, which was just across the road. We will sort their history out when we write the post on number 4, but for now, the story of 263 Tottenham Court Road / 1 Great Russell Street has come to an end. (1) The London Gazette, 16 February 1838. (2) Old Bailey case t18400406-1078. Thanks go to Lyn Olds who is a descendent of Isaac. (3) Old Bailey case t18400406-1161. (4) Old Bailey case t18400511-1431. (5) Old Bailey case t18400706-1862. (6) The Southern Star and London and Brighton Patriot, 12 July 1840. (7) Old Bailey case t18400817-2011. (8) Old Bailey case t18420131-772. (9) Old Bailey case t18440506-1501. (10) The London Gazette, 13 June 1845. (11) The London Gazette, 28 July 1849. 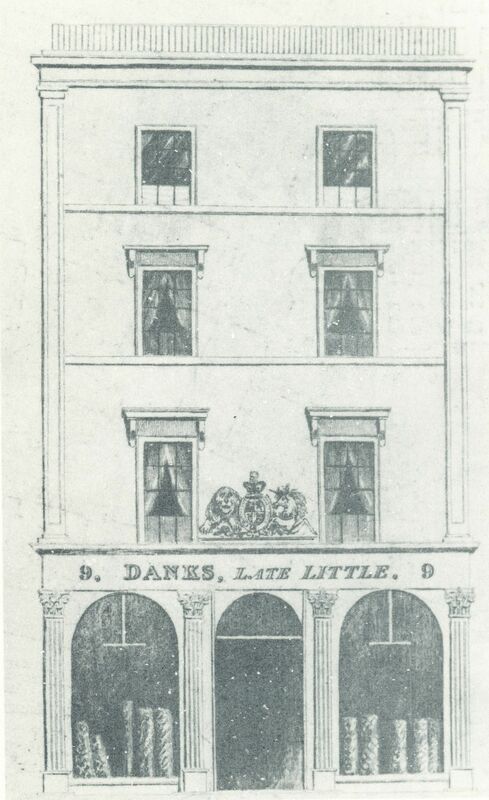 When Thomas Danks of Hatton Garden and Baldwin Gardens died in 1837, his two shops were divided between his sons. The property at 98 Hatton Garden was given to his sons Michael, Josiah and Andrew Sidesman (the latter the son of his second wife Elizabeth Scudemore). See for the story of that shop my other blog post here, but in this post we will concentrate on the other side of the family, that is, sons Thomas junior and Jeremiah who were given “all the stock in trade looms for manufacturing hearth rugs implements and fixtures and also all other effects whatsoever belonging to me which may be in or upon the said premises in Baldwins Gardens at the time of my decease”. (1) Jeremiah and Thomas formed a partnership as carpet dealers and hearth-rug manufacturers, but the co-operation did not last very long. Already on the 14th of June, 1838, they dissolved the partnership of “Danks Brothers” at 9, Tottenham Court Road and 41, Baldwin Gardens. (2) Where Thomas went after the split is unclear [P.S. 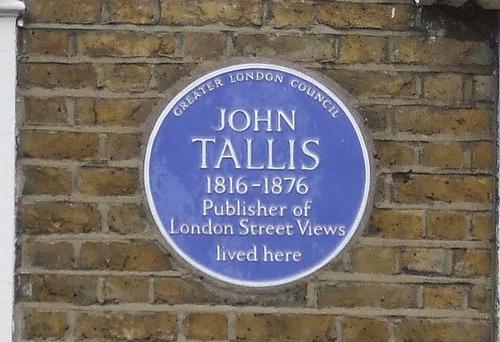 : look at the comments to this post], but Jeremiah was certainly in the carpet business at Tottenham Court Road when Tallis produced his Street Views around 1839. Jeremiah splashed out in a major way on advertising space in Tallis’s booklet; no mention of Baldwin Gardens anymore, by the way; did that go to Thomas when they split up? Not only was the vignette in the booklet of Jeremiah’s property, he also claimed 2 of the 3 columns on one of the advertorial pages, giving us lots of information about the business, such as the names of his predeccessors at 9 Tottenham Court Road: G.H. Humphries and Thomas Little. The Sun Fire Office records do indeed have Thomas Little, carpet manufacturer, at number 9 in 1811 and he was still there until at least 1824 when he gave evidence in an Old Bailey case. (3) According to the Sun Fire Office, George Hallen Humphreys can be found at number 9 in 1832 and presumably only left when the Danks brothers moved in. On the 11th of November, 1840, Jeremiah married Martha Berdoe, the daughter of Joseph and Susanna Berdoe, at St. Pancras Paris Chapel. Martha was the sister of Rebecca Berdoe who had married Jeremiah’s brother Josiah the previous year. Jeremiah and Martha had at least one child, Jeremiah Martin John (often simply called Martin), born in ±1847. 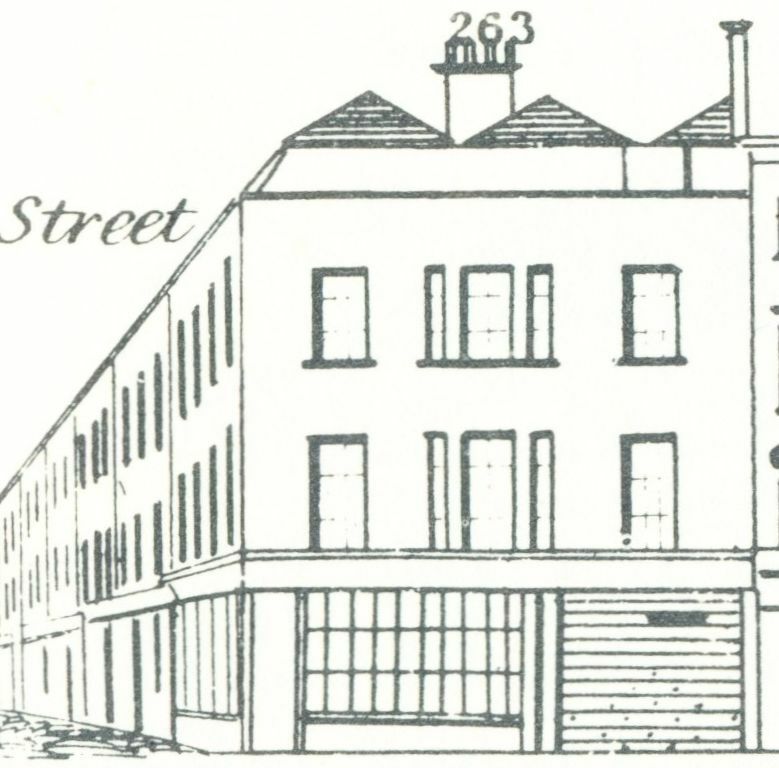 In 1851, the family no longer lived at Tottenham Court Road but at Alfred Terrace, St. Leonard Shoreditch. 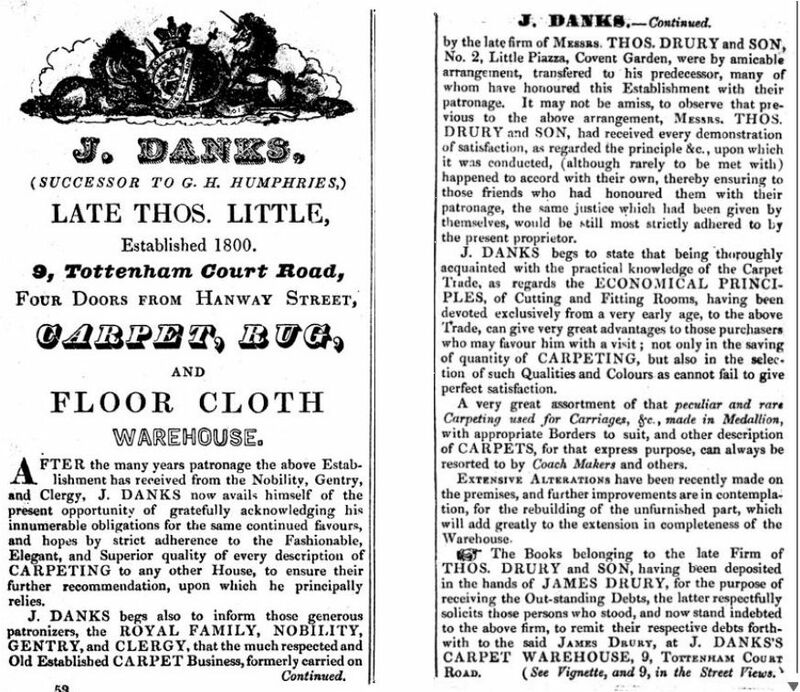 Jeremiah is given the occupation of house agent and collector of rents, so the carpet business must have been abandoned somewhere between 1841 and 1851. Young Martin can be found as a pupil at Byron House School in Ealing in 1861, but where his parents are at that time remains a mystery. In 1871, Martin, by then an American bankers’ clerk, can be found at 15 Barossa Place, Chelsea (now South Parade), living with his widowed aunt Caroline Danks (the wife of Martin’s uncle Michael) and her children Flower, Elisabeth and Alfred. Martin’s mother, Martha, can be found at the time of the 1871 census in Brighton with her widowed father. This might be construed as a family visit, but for the fact that, at the same time, her husband Jeremiah can be found as an inmate in the Essex County lunatic asylum. Oh dear! 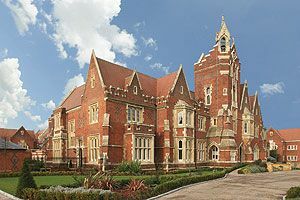 No sign of Jeremiah in 1881, but in 1891, he is a patient at Lea Hall lunatic asylum, Leyton, Essex. The Essex County asylum, Warley Hospital in Brentwood, had been opened in 1853, but quickly filled up, despite several extentions, and the “chronic and harmless” had to be housed elsewhere. In 1879, Lea Hall in Walthamstow was rented to house some of the inmates, one of them apparently Jeremiah. The lease on Lea Hall ran out in 1891 and yet another home was sought. (4) Jeremiah died in 1897, 81 years old, and his place of death is given as Billericay. (5) Jeremiah may have been moved when the lease ran out to Billaricay Workhouse (see here), although Warley Hospital itself was in the Billericay Registrar’s District, so he may just have been moved back to the main institution. (1) The National Archives; Kew, England; Prerogative Court of Canterbury and Related Probate Jurisdictions: Will Registers; Class: PROB 11; Piece: 1876. (2) The London Gazette, 26 June 1838. (4) For the history of the Essex County lunatic asylum see here. (5) England & Wales, FreeBMD Death Index, April, May, June 1897. (6) England & Wales, National Probate Calendar (Index of Wills and Administrations), 1907. You may also like to read the post on the other side of the family, Danks and son at 98-99 Hatton Garden.